There are officially 12 days to Christmas. And for me, that means 12 days of peppermint. It sounds like a Christmas carol, doesn’t it? For me, that means I have 12 days to see how many peppermint/candy cane goodies I can stuff in my face before it’s not acceptable anymore (but really, peppermint is enjoyed year-round! So it’s always acceptable). 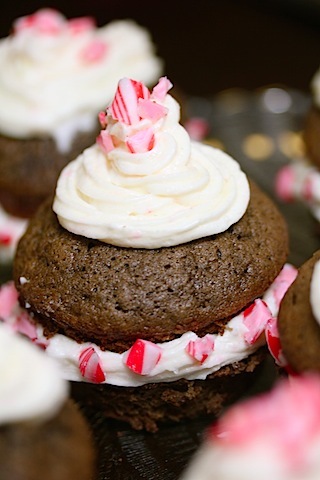 When I saw this Chocolate Peppermint Cupcake recipe, it was too beautiful to resist. It came with its share of complications, but was totally worth it. If only because I had dreams about the peppermint frosting (no, really, I actually did). Nothing like peppermint frosting dreams to ensure you have a fabulous next day. One of the “complications” is what happened to half the cupcakes. See, I went to two holiday parties on Saturday night. I carefully packed up all my cupcakes and ended up with a platter of them on my lap for the first party, safely covered in tinfoil. Well, a freaking bicycle pulled out in front of us while we were driving to the first party and all the cupcakes slid off the platter and onto the car floor. And my boots. I had icing all over my boots. And Chris had icing all over his car. And the cupcakes were beyond saving. Wah. Happy holidays to me. Anyway, moving on (really, I’m trying). 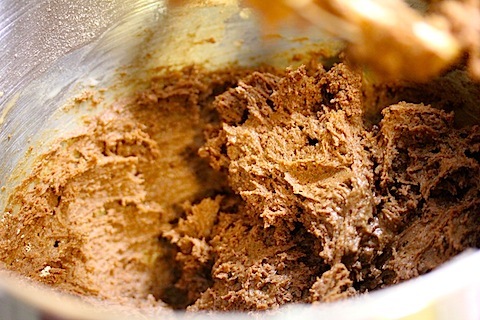 If you have a favorite chocolate cupcake recipe, definitely use it and just use this frosting recipe. The cupcake part didn’t wow me. The recipe was super strange, but I decided to try it because I don’t have a favorite chocolate cupcake recipe and thought this could be amazing. But then I didn’t want to use shortening (am I the only person who’s seriously averse to shortening?? ), so I used butter instead. And instead of water, I used milk. But the cupcakes were a little dry. For the second batch I added more chocolate chips and they were much better. Anyway, the frosting makes these totally worth it. I didn’t photograph the frosting recipe (my kitchen was already a disaster at this point), but here’s the recipe (and really, you have to make this, even if it’s just to take frosting shots. Yes, frosting shots are a real and incredibly delightful thing!). 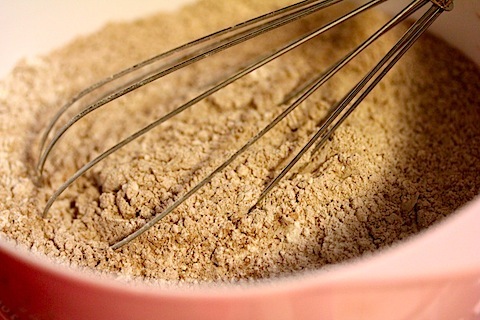 In a medium bowl, stir together flour, cocoa powder, baking powder, baking soda, and salt. Set aside. In an electric mixer (or large bowl with hand mixer), beat butter on high speed for 30 seconds, Add 1 C sugar and vanilla. Beat until combined, scraping down the sides of the bowl. Add egg yolks one at a time, beating well after each addition. Alternate, adding 1/2 the flour mixture and and 1/2 the milk to the butter mixture, beating on low speed until just combined. Then add the rest of the flour and the rest of the milk. 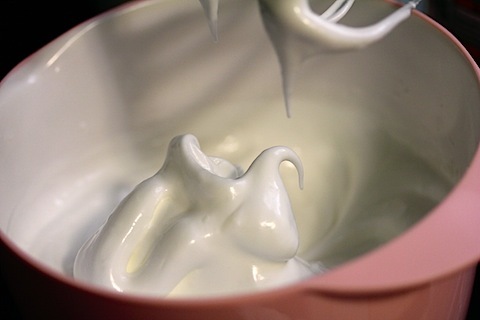 Then, in another bowl, beat egg whites on medium speed until soft peaks form. I used my hand mixer for this part. Then, add 2/3 C sugar, 1 T at a time, beating on high speed, until stiff peaks form. 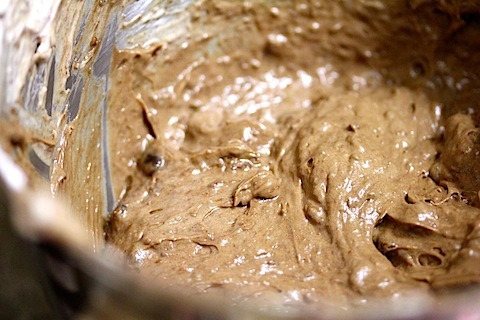 Fold the egg white mixture into the chocolate batter in small batches. And gently fold in the chocolate chips. 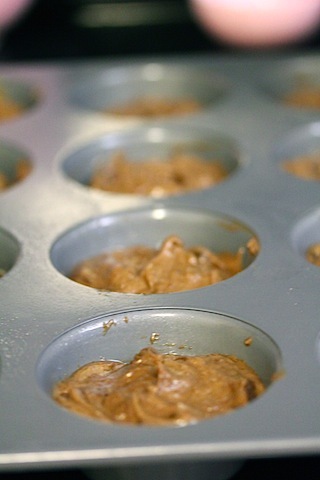 Spoon batter into lightly greased cupcake tins. And bake cupcakes at 350 degrees for 20 to 22 minutes. 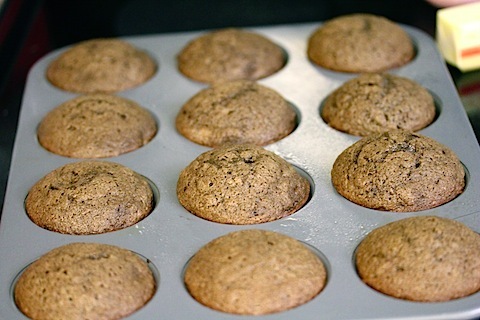 Let cupcakes cool in pan before removing. I baked my cupcakes in batches of 12, so after the first ones were done and I saw they were a tad dry, I added some more chocolate chips to the remaining batter and those seemed to be much more moist. OK, on to the glorious frosting! 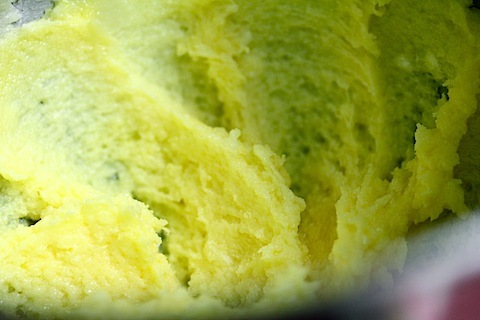 In a medium bowl, beat butter with electric mixer on medium speed, until fluffy. I KNOW it’s a lot of butter. Ignore it; it’s worth it. And the sugar balances it out. Gradually add 3 cups of powdered sugar, beating well. Beat in 3 T milk and the peppermint extract, too. 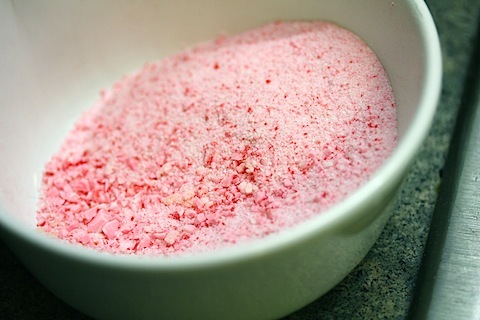 I still had some of this peppermint powder from my Peppermint Sugar Cookies sitting in a bowl on my counter. I decided to sprinkle some in my frosting. Totally unnecessary, but delightful nonetheless. Also, put your candy canes into a plastic bag and crush them. But leave them in chunks and not so powder-like like you see above. Now that your cupcakes are cooled, cut them in half horizontally Pipe about 1 T of frosting onto the bottom of the cupcake and then replace the top and push down to spread frosting to edges. I used a pastry bag, but you could just spoon the icing on it you want. Here, you can put your candy cane pieces on a sheet of waxed paper and roll the sides of the cupcakes into the candies to coat frosting. But I found this to be rather messy, so I just held the cupcakes and sprinkled the candies around. Pipe or spread remaining frosting on top of cupcake. Sprinkle with more peppermint candies. The frosting was absolutely AWESOME and the chocolate peppermint combination was seriously the stuff of dreams. And to be honest, it didn’t even matter much that the cupcakes were a bit dry because the creamy, buttery frosting sandwiched between totally made up for it. I loved the way the original photo looked with the huge candy cane pieces, but while quite aesthetically pleasing, I thought it could possibly break party-goers teeth. So, I crushed mine a little bit more. I don’t think I’ll ever be satisfied by a cupcake again unless it has frosting in the middle of it and on the top. Overall, I would most definitely make these again. But really, I’d just like to make a huge vat of that frosting and take a bath in it. Or at least spread it on toast. Or waffles. Or candy bars. The possibilities are endless, really. Or wait. Spreading this frosting onto those Peppermint Sugar Cookies?? Yes, yes, yes!!! In the meantime, please send any and all out-of-this-world chocolate cupcakes, so I can make these even better next time! 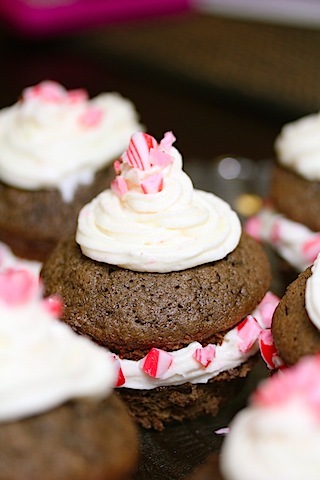 41 Responses to "Chocolate Peppermint Cupcakes"
These cupcakes are adorable! The cake looks so light and fluffy. Also, I did not realize it is 12 days till Christmas. Eek! You’ve convinced me – I want to make that frosting!! I can’t wait to try it 🙂 I also have been addicted to peppermint this year. I must have put at least 5 or 6 peppermint recipes on my blog in the last few weeks! I love the peppermint-chocolate flavor combination, and I just posted mini mint-chocolate cheesecakes :). Your cupcakes are beautifully decorated! YUM! I’m anti-shortening as well (yuck trans fats). I found an all-natural, non-hydrogenated shortening at Whole Foods which is great (Earth Balance brand, near the margerine). I used it for my christmas cookies that I made yesterday (post to come today). I would cry if my hard work fell all over the place. But I cry for the littlest things sometimes. Im really feeling all the peppermint recipes. ! ! These are sooo adorable. The ‘bicycle incident’ is such a bummer. I probably (ok, definitely) would have cried!! Yes, I DO have a serious aversion to shortening. I refuse to even buy it! There is a chocolate cake recipe in the Taste of Home cookbook that I always use for my cupcakes and it is fantastic! Also, I love to use my bag and frosting tip to fill the cupcakes with the frosting before topping them. Similar effect as cutting them in half, but without as much hassle and mess (also without the ability to sprinkle pretty peppermint candy on the outside edges…). Those look gorgeous. I am not generally a peppermint fan but it’s slowly growing on me. I love that you’ve given us not one, but two minty treats. And don’t remind me of how close to xmas we are. :-O I still have so much left to do. I’m totally averse to shortening too! I avoid it in all recipes. Butter is better by far 🙂 I also LOOOOVE peppermint anything, and appreciate how it’s so in style this time of year! These cupcakes look great, especially the frosting! These look so pretty! When Bret and I went to go buy our Christmas tree, it was tied carefully by the nursery on top of our Zipcar. We were driving home slowly when a car swerved into the road without looking. Bret honked and braked just in time to prevent an accident but our tree almost seriously went through the hood of the car. It was crazy! I guess crazy drivers are out there this holiday season! Oh my goodness, those might be the prettiest cupcakes I’ve ever seen!! SO sad that some ended up in your lap/on your boots…I might have cried if my cupcakes looked that good! I totally agree- peppermint=Christmas! 🙂 These look so amazing… I can’t wait to make them! In that case, I highly recommend the Flour chocolate cupcake recipe. Mary Kate has it on her blog… and I’ve linked to it. They are rich and moist and since they go so well with peanut butter frosting, I have a good feeling they would work with this peppermint frosting too. Sorry about the catastrophes. I usually clutch my baked goods in the car because I’m terrified they’ll slide and all my hard work will be wasted. I feel your pain. These look out of this world! What’s better than a chocolate cupcake? I haven’t figured out the whole food in the car thing myself, although I’m unusually tempted by those cupcake boxes I see at Target now and then. Sorry about your boots – but all in the name of peppermint! These look fabulous and even though I can’t bake, I could definitely make the effort for this frosting. I’m bookmarking this one! I really wish I could bake better- these look amazingly adorable!! Maybe I’ll try them but I don’t think they’ll come out as pretty as these did. These are way too cute! These cupcakes are so pretty! I love how the frosting is sandwiched between the cupcake. Yum- love mint and chocolate! And they look so pretty- perfect for the holidays! These came out beautifully!! That is my FAVORITE type of frosting as well…powdered sugar, butter, milk….all you need! 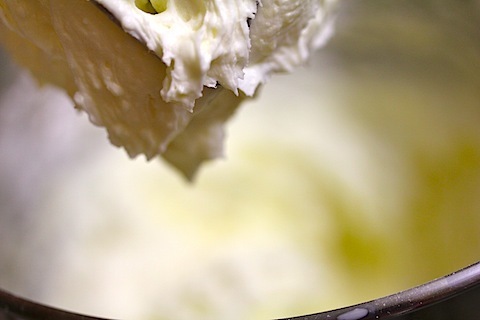 Of all the cakes from all the bakeries, this simple frosting is the BEST! Chocolate peppermint cupcakes were definitely on my mind today! How ironic that you posted this. I’m having a hard time resisting the urge to just make that frosting and eat the whole thing myself! I love chocolate peppermint cupcakes! I also do not like shortening except I do use it combined with butter for pie crusts because I think that it works better than all butter. The worst is “buttercream” made with shortening. For one, it’s not buttercream if there is no butter, and it just doesn’t taste good. oh you have outdone yourself!!! WOWOWOWOW these look so good! 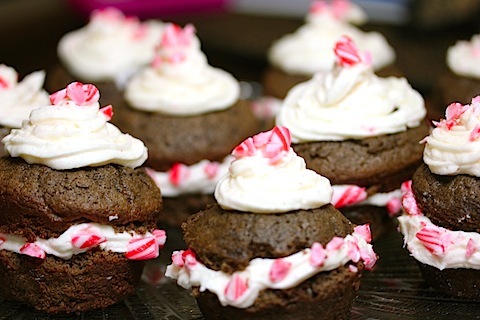 i love peppermint and chocolat together and these cupcakes are perfect!! i love that you stuffed them too 🙂 the more the better! Beautiful cupcakes! The original cupcake story made me so sad though 🙁 I would have cried! 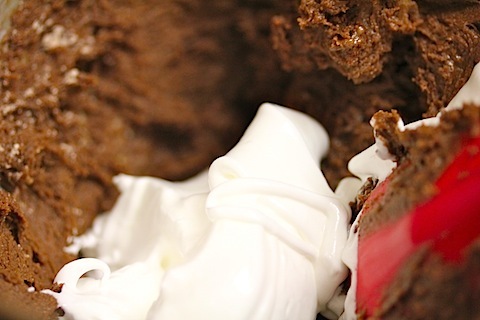 Sorry about your cupcake accident….but did you have fun licking the frosting off everything? 🙂 Cause it sure sounds great. 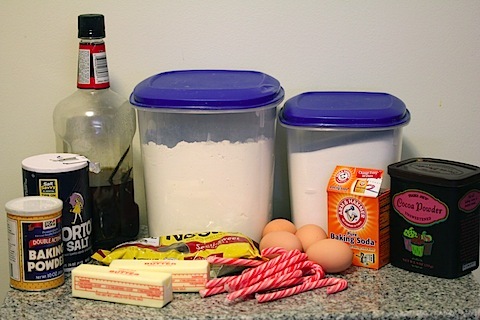 I’ll use my own chocolate cupcake recipe on your advice. But I sure love the way your turned out! These are so fun and festive. I love how your decorated them! I’m in love with the line: peppermint frosting dreams. These are yuletide greetings! Yearning for this chocolatey-peppermint goodness right now. you totally made me lol with the sugar balances out the butter comment 🙂 so sorry to hear about the ones that got lost in the car… at least it was only half of them! now i want some of that frosting! I have a question about these. do they need to be refridgerated? or can i keep them out of the fridge for the day. I am going to make them for my students next week and i want them to be great! Okay so I was also lured into this recipe by the frosting and was just too lazy to make cupcakes from scratch just to use the frosting. In the book this recipe is called Red Velvet Cupcakes with White Chocolate Peppermint Cream Cheese Frosting. These look SO good and totally scream Christmas. This frosting was UNBELIEVABLE! I made a chocolate cookie cake with this frosting as filling… my family now demands Diabetes Cake (their title, not mine) at every function. I love the peppermint-chocolate flavor. I can’t wait to try these for our family picnic. I hope they will like this. I’m going to give your frosting and double deck cupcake a try with my favorite chocolate cake or cupcake recipte. Its Ina Garten Beatty’s chocolate cake on Food Network. The only change I make is substituting 1 cup hot water plus 1/2 tsp instant coffee powder/espresso powder for the hot coffee since I don’t drink coffee and never have it on hand. It is so moist and freezes well when I need to make ahead of time.